The Dragunov SPD forex trading system is named after the name of Dragunov SPD gun. I named the system after the name of a gun because I consider forex trading as a war. As the soldiers at war, currency traders not only need to gain the pips but also to protect themselves from the enemies through risk management and effective order execution. Anyways, this trading system is designed for the day traders, and it does not require any technical indicators. Commonly, 30 to 50 pips can be gained with this trading system. This trading system should be applied on the 15m or 30m chart. Any currency pairs can be traded with this trading system. How to execute a long trade with "The Dragunov SPD" forex trading system? (a) Identify the support level. (b) Identify a candle that has a long shadow that breaks the support level (this candle is called the false break candle). (c) Wait for the long shadow candle to be closed as a bull candle. (d) Enter at the opening of the next candle. (e) Put the stop loss 5-10 pips lower than the low of the long shadow candle. (d) Profit target can be placed in different ways like at the next resistance level or at 1:1/1:2/1:3 risk to reward ratio. 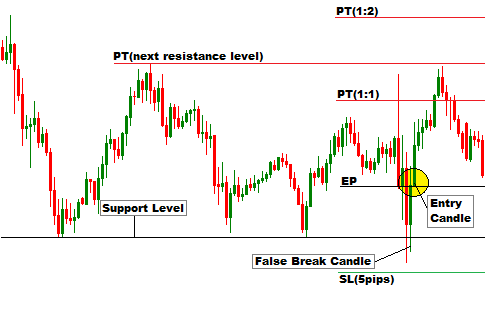 Above illustration shows the way to enter a long order with this trading system. How to execute a short trade with "The Dragunov SPD" forex trading system? (a) Identify the resistance level. (b) Identify a candle that has a long shadow that breaks the resistance level (this candle is called the false break candle). (c) Wait for the long shadow candle to be closed as a bear candle. (e) Put the stop loss 5-10 pips higher than the high of the long shadow candle. (d) Profit target can be placed in different ways like at the next support level or at 1:1/1:2/1:3 risk to reward ratio. 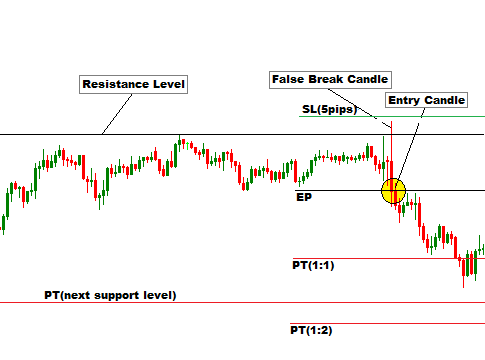 Above illustration shows the way to enter a short order with this trading system.